Enchanted Tiki Room 50th Anniversary! I couldn’t let this day go by without an tip of the hat to one of my favorite attractions at Disneyland – The Enchanted Tiki Room. Today is the 50th Anniversary of its opening at the park! As a kid I remember being completely enthralled by this show…especially when the thunder clapped and it started pouring rain. Even though I knew it was bright and sunny outside, it was pretty easy to immerse yourself into that world and think that you really were in the South Pacific. While I am not as easily transported today, I still put it on the top of my list when visiting Disneyland. The show is so loaded with nostalgia, it’s impossible not to. As far as postcards that refer to the Enchanted Tiki Room, if you go to the checklist and search on “Tiki” you will get six results. NT0310 (B-16) is a super common card that is probably the most recognizable card for the attraction. 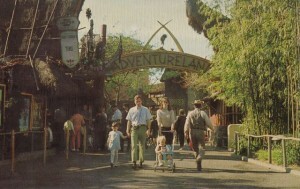 Other cards all include the entrance to Adventureland, but mention the United Airlines sponsored Enchanted Tiki Room in the card text. NT0683 is shown here (you can see the United Airline logo above the Tiki room shingle…but it is a little dim). I do not have NT0681 or NT0682 in my collection…so I don’t have scans of those cards. NT0699 is the same image as NT0310. Anyway, imagining a Dole Pineapple float in my hand…I will propose a toast to the Enchanted Tiki Room and its 50 years…here’s to 50 more! 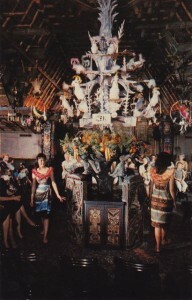 This entry was posted in Disney, Disney Postcards, Disneyland, Disneyland Postcards and tagged Disney Postcards, Disneyland, Enchanted Tiki Room. Bookmark the permalink.